Federal pipeline regulators on Friday put Hilcorp Alaska on notice that a crude oil pipeline of the same vintage and size as the company's leaking gas line in Cook Inlet could be threatened by the same forces that ruptured the gas line and cause a far more dangerous leak. The Pipeline and Hazardous Materials Safety Administration had already issued a proposed order that Hilcorp fix the gas leak by May 1 or shut down the leaking gas pipeline. On Friday, the agency sent a second proposed order to Hilcorp. 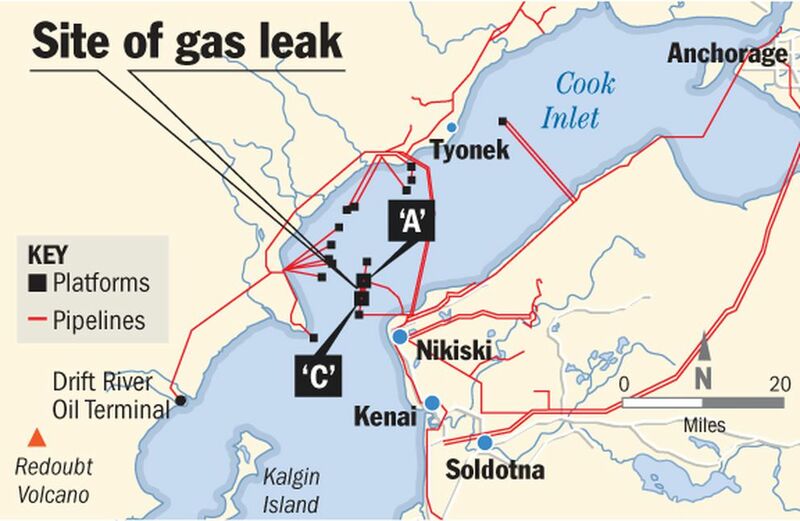 Now, it also wants the company to conduct internal and external inspections of the "substantially similar" underwater pipeline that carries crude oil to shore from two offshore production platforms located in Cook Inlet northwest of Nikiski. That crude oil pipeline is operating as it should, the company said Friday. The crude oil line runs beside the leaking gas line, according to the agency's proposed safety order, sent Friday and signed by Chris Hoidal, PHMSA's western region director. Both of the 8-inch steel pipelines were installed in the mid-1960s as the Cook Inlet oil boom was building. PHMSA said the gas line leaked twice in 2014 in summer, but repairs were made before Hilcorp acquired the facilities from the previous operator. The leaks were caused by abrasion from rocks in areas where the pipeline is not supported by the seabed, the agency said. "Although the cause of the ongoing leak on the (gas pipeline) is unknown, past leaks on the pipeline have occurred due to outside forces," such as pipe vibration or rock damage, the notice said. It's reasonable to conclude that "similar conditions" are also present for the crude-oil line, the notice said. Hilcorp detected the gas leak Feb. 7 when a helicopter flying above the pipeline route spotted roiling waters. Hilcorp has indicated the leak began in December, according to PHMSA. Hilcorp has said pan ice and strong tides in Cook Inlet present dangers for repair divers. The company doesn't expect to begin finding and fixing the leak — about 80 feet underwater — until the ice clears. That is not expected to happen until at least late March, the agency said. The notice said environmental harm from an oil leak could be "significantly greater" than from the gas leak, while Hilcorp's ability to respond could be severely hampered in winter. Estimates show only 340 endangered Cook Inlet beluga whales remain, so deaths of individual whales could have "population-level effects," the notice said. Data collected from satellite-tagged belugas in 2002 and 2003 show they spent a lot of time near the pipelines in March, the agency said. While hazards to birds and ducks are currently low, those risks will increase once more birds arrive in seasonal migrations starting late this month. Migrations of hooligan and salmon smelt will also begin about mid-April, presenting more concerns, the agency said. PHMSA said the annual side-scan sonar or multibeam echo-sounder surveys currently performed by Hilcorp don't provide enough information to notice corrosion, dents, gouges and other problems with the pipes. The agency noted that Hilcorp conducts diver inspections. As it did in its March 3 notice, PHMSA calls for more thorough external inspections of the pipe, as well as internal inspections by Sept. 30, which currently aren't conducted. Internal inspections would involve an upgrade to the pipeline to allow reviews by a "smart pig," a device that moves through the line to detect dents, wall thinning and other problems, said Lois Epstein, an Alaska-licensed engineer and Arctic program director for The Wilderness Society. "Given that the breached gas pipeline has had three failures since 2014, it's clear that Hilcorp has not adequately addressed known risks to pipelines in Cook Inlet," she said. PHMSA's order is not final, and can be challenged by Hilcorp. After a final order is issued, Hilcorp will have 21 days to externally inspect the pipeline or shut it down and purge it, the agency said. It might also need to be shut down if it's deemed unsafe. Hilcorp said it will work with PHMSA and other agencies "to ensure a thorough and timely response" to the proposed order's concerns. Hilcorp acquired the pipeline in September 2015 and completed a successful pressure test on the line, said a statement provided by Lori Nelson, external affairs manager at Hilcorp Alaska. "Hilcorp continues to focus on addressing the natural gas pipeline leak and ensuring the safety of our responders in the field," the statement said.